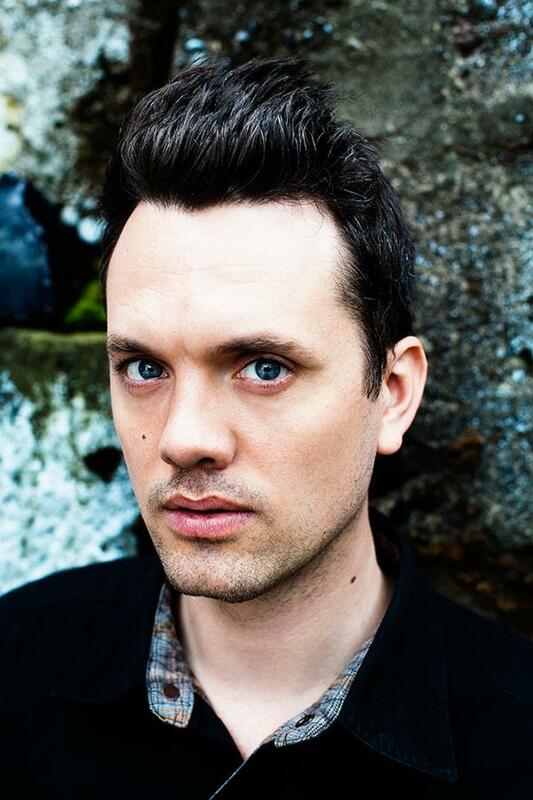 Saturday’s Music Now concert featured the world premiere of “Collider” by the Icelandic composer Daniel Bjarnason. Inspired by the the Large Hadron Collider based at the CERN laboratory, this work uses a gigantic orchestra. It starts in the deep basement, with the low instruments giving a real sense of the huge scale of this machine. This sense of space was maintained throughout, supported by large masses of instruments, enhanced by lightly scored delicate moments. This music flows in a way that can be easily followed on first hearing, though I am convinced that there are riches here that would reward hearing it again. I enjoyed hearing this piece immensely: the only disappointment was that it ended so soon. Janelle Gelfand, in her review of the concert for the Cincinnati Enquirer, said, “It was the kind of well-crafted and imaginative piece that could see life beyond this performance.” This praise is too faint-hearted. Though Bjarnason is not nearly as iconoclastic as Varèse, (After all, what icons are left to smash these days? ), Collider sat comfortably beside Amériques on this program, and deserves a place along side it in the orchestral repertoire. I look forward to hearing it again. The evening began with a pre-concert performance by the innovative quartet SŌ Percussion. They played instruments hey had assembled themselves. These seemed to resemble electrified hammer dulcimers, though some of the strings were very low, and the raucous booming bass during the loud passages did not sound at all like the delicate sweet tones of a hammer dulcimer. These instruments were bowed or struck with various sizes sticks, the smallest of which looked like they might be pencils. Generally, each person played relatively simple part very precisely coordinated with the others, occasionally to build something that resembled a melody, but more often a complex, coherent texture. The piece moved from one soundscape to another, often with the players changing implements, exploring the sonic possibilities of the instruments that they had created. At one point, I began wondering whether they would ever let loose, and soon they did. The raucous sound prompted a few to leave the hall, but I was delighted. 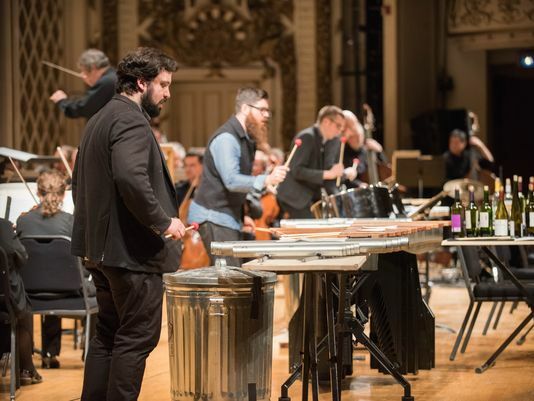 The SŌ Percussion was also featured on the first piece of the symphony concert: “Man Made”, a concerto for percussion quartet written by David Lang. This piece has several sections, each with a different ensemble of percussion instruments. The work begins with the percussionists snapping sticks to make the sound, dropping the broken implements on the floor. Later they moved to pitched instruments. In the program notes, Lang describes the difficulties in marrying the approach of these inventive percussionists with the traditional orchestra. These problems he solves successfully: sometimes, the full orchestra plays a short note simultaneously, like one giant drum. Unfortunately, Lang did not supply much inspiration. SŌ Percussion did much better on their own, unencumbered by the orchestra or David Lang’s clever composition. Also before the concert, Timo Andres gave a piano recital in the Cobett Tower. I went upstairs after the SŌ Percussion piece ended, catching the end of a Schubert piece. I was immediately struck by the beauty of the playing. Andres followed this with an étude by Steve Reich, which was again very nicely played. Andres ended with a piece of his own, which I found less engaging. In the intermission, Lanzendorf played in the lobby. Their style worked better for this purpose than Mina Tindle the previous night because their music (at least what I heard) is more atmospheric and ambient, with fewer details to get lost in the crowd noise and echo of the lobby. 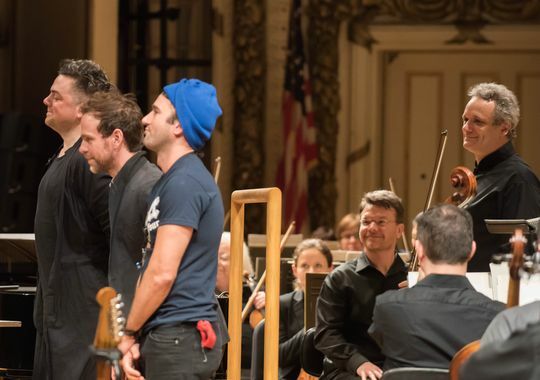 For some in the audience, the main event was after intermission: the set of five songs from the series called “The Planets”, a collaboration by Sufjan Stevens on vocals, Bryce Dessner on guitar, and Nico Muhly on keyboard, accompanied by the orchestra. I thought it was dull. Far from dull was the concert finale: Amériques by Edgard Varèse. This modernist monument from the post World War I era is full of Varèse’s enthusiasm for the vitality of his newly adopted country and his fascination with machines. I have heard it in concert several times before. In one performance, the siren was frequently allowed to dominate, transforming the piece into a concerto for annoying siren and orchestra. Although the siren was certainly prominent in some passages, Langrée is too refined to let it take over. Under his direction, the orchestra was both well balanced and energetic. It was a thrilling conclusion to this fine concert.